Come down to the clubhouse at Centrala idrottsplatsen on Mondays and Thursdays and enjoy a full rugby training on grass! trainnig starts at 7pm and ends around 8.30. On Thursdays we have a social after the training so make time for some extra fun! This entry was posted in Management on July 25, 2009 by admin. For everyone who might not be on googlegroups and whatnot; We need to be there at 10am to sign in. Cars are leaving from the clubhouse at 08.00.. am. Those who are sleeping at alevallen register on the beach. Cars and sleeping arrangements are organized by Jonas and Ian for the guys and by me for the girls. Food and beer is served at the pitch, so no need to worry about that. Bring cash, sleeping bags and other impractical things that you need as snuttefiltar, solstolar and such. It may or may not rain. In any instances it will be a great time! This entry was posted in Festivities, Management, Men's Team, Women's Team on July 10, 2009 by admin. As you are aware our very own Amanda Sandsborg has been selected to represent Sweden in the European 7s. 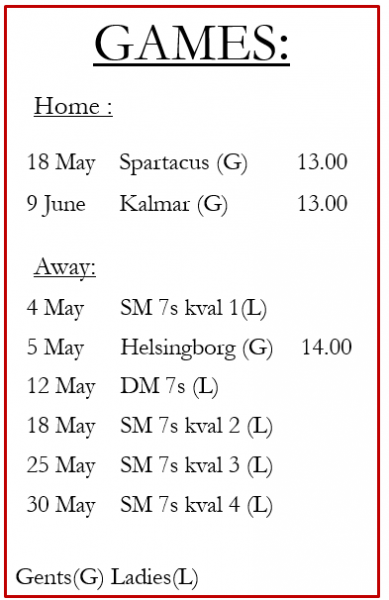 Together with the fastest and and strongest in Swedish Womens Rugby they will hopefully set out to make a mark no less than what the ladies did in the 15s. The preparation has not been as extensive, but 7s might be a sport on the move if they are one of the two approved sports for the Olympics in 2016. In any case we are proud to see that all of Amandas hard work and talent have paid off and we hope she will get a lot of game time and stay cool all the way as only Amanda can! Sweden is playing England, Spain, France and Portugal and are seeded 4 out of 5 in that group. In pool B the Netherlands, Russia, Italy, Germany and Moldova are playing for the other spots in the Sunday finals. For schedule and other info look here european 7s. Interested in more 7s? Go to www.irbsevens.com. Havent had the time to put your vote on the next olympic sport yet? well, do so now and click away to www.olympic-rugby.org. This entry was posted in News on July 9, 2009 by admin. The pictures from the game taken by A Allerbo och M Petersson can be found on the following link, courtesy of HRC Gripen. This entry was posted in Men's Team, Women's Team on July 6, 2009 by admin. The really hot stinking humid weather seems to have lifted, but we girls are still looking for some quality beach time. We plan to meet at the club at six tonight and drive out to Lomma and play some rugby in the sand. Everyone is welcome, hopefully bbq afterwards if the weather stays like this. If you want to go there beforehand it is the beach at the parking lot after Lomma camping. Bring water, mouthguard and bathing suites! I will bring a little disposable bbq and rugby balls. This entry was posted in Festivities on July 6, 2009 by admin.